In order to promote recycling among schools students in the US, the Keep America Beautiful organization conducted a Recycle-Bowl. 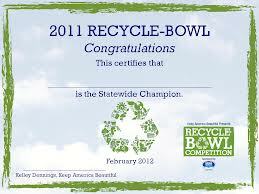 This Recycle-Bowl contest was conducted all over the US, and approximately 1,577 schools took part in it. In this competition, the schools competed with each other to win the prize of the most eco-friendly school in the US, and the organizers are hoping that more and more schools will participate in this competition in the coming years. Schools from various cities, counties, and borough regions in the US took part in the Recycle-Bowl. This competition is meant to encourage recycling behavior among the school children, and a lot of the school authorities think that this competition is a good medium to promote recycling among the children. This year, the Recycle-Bowl was won by Marshall Christian Academy. The authorities at the school confessed that due to the competition, the students and the faculty members took part in all the recycling initiatives taken by the school. As a matter of fact, the school was able to recycle approximately 40 pounds of waste per child. According to Booby Bentley, a Pastor from the Brashers Chapel Church, such recycling competitions help people realize the importance of preserving their resources. He feels that taking part in such competitions teaches school children the value of all the materialistic things that they use, and it also makes the adults realize the need to promote eco friendly promotional items. The Director of the Albertville Boaz Recycling Center, Jeannie Courington, stated that during this competition, all the schools submitted more waste to the recycling center. She stated that it was nice to see all the schools coming together to improve their recycling rates. She feels that if all the schools’ authorities make an attempt to increase their recycling rates throughout the year, a lot of the domestic waste can be recycled. Furthermore, she also feels that if the rest of the residents take up recycling activities this seriously, the city’s waste recycling issues will be curbed easily. The authorities at Marshall Christian Academy are very happy as they have been awarded a prize in this competition for the second time in the past two years. The Principal of the school is happy that the school was recognized for all its efforts. The Recruiting and Marketing Director at the school, Pam Miller, stated that this was a combined effort of the students and the teachers, and the school will continue to take steps to maintain its eco-friendly image.